When my story Beautiful Liar came out of contract with Amber Quill, I knew there was more to tell about Johnny and Brett’s relationship. I had ended the story where I did for a variety of reasons, not the least being that there was a word limit imposed on the Amber Pax for which I originally wrote the story. When the rights for the story reverted back to me, I read through it again and realized there was an opening at the story for more. Because so many people had already purchased the original story, I didn’t want to add anything new to it and release it as “new and improved” — it wasn’t fair to make those readers buy it again just for the added content. So I decided to put the rest of the story into a new e-book, which would appear in the new print edition, as well. In Beautiful Liar, former childhood television star Johnny Thomas wants to get back into show business. He hires his old manager, Lou, who has heard rumors of Johnny’s sexuality. Though he’s advised to play it straight, Johnny falls for Brett, a photographer whose candid shots of the lovers almost sinks Johnny’s career before it can get off the ground. 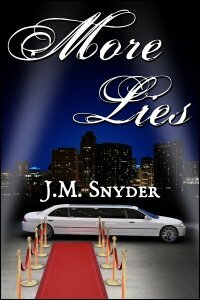 More Lies takes place several months after Johnny’s landed a coveted role in the upcoming Roxy Greene summer blockbuster. Lou tells him Roxy wants the media to think she and Johnny are a hot item off the set to build buzz for the movie. Now that he’s dating Brett, Johnny doesn’t feel comfortable lying about his love life, but surprisingly his boyfriend thinks it’s a great idea. But when Johnny and Roxy meet for the first time, it’s evident neither of them are keen on the charade. If Roxy’s attitude is any indication, she can’t stand Johnny. What happens when she finds out he’s lying about his sexuality to keep his role in her film? count me in. congrats on the new release. Please count me in!! I really liked Johnny and Brett. Count me in, please! It’s always fun to catch up with former characters. I’m being nice today. All three of you win!